Are actively engaged in collaborations or coalitions working towards these policies. 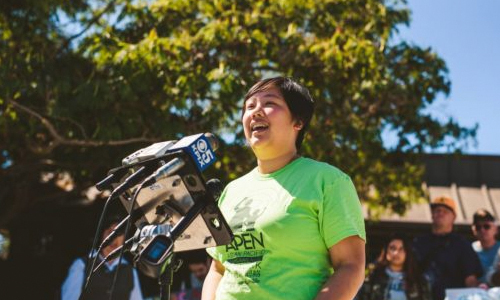 APEN is a collective voice of Asian and Pacific Islander (API) immigrants and refugees. They focus on educating, organizing, and mobilizing API immigrant and refugee communities with the vision of making sure that all people have a right to a clean and healthy environment, in which their communities can live, work, learn, play, and thrive. 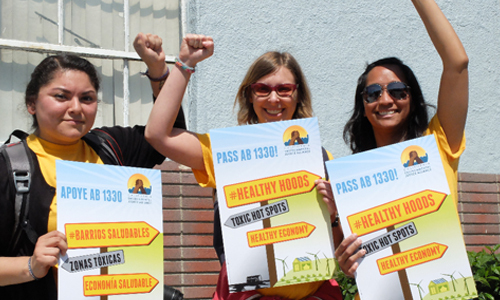 The California Environmental Justice Alliance (CEJA) is a statewide, community-led alliance that works to achieve environmental justice by advancing policy solutions. They unite the powerful local organizing of their members in the communities most impacted by environmental hazards — low income communities and communities of color. The CCC is an alliance of 19 culturally-specific community based organizations with representation from six communities of color. CCC addresses the socioeconomic disparities, institutional racism, and inequity of services experienced by their families, children and communities through organizing their communities for collective action. Ecotrust is a regional organization powered by the vision of a world where people and nature thrive. From forestry to finance, food access to green building, they advance economic development that is driven by both equity and environmental resilience goals. EHC is dedicated to achieving environmental and social justice. They believe that justice is accomplished by empowered communities acting together to make social change. They organize and advocate to protect public health and the environment threatened by toxic pollution. LAANE is dedicated to ensuring that people of all backgrounds have an equal say in our democracy and an equal chance in our economy. Through organizing of individuals and coalitions, research, and advocacy, LAANE engages in projects that will build power to win good jobs, thriving communities, racial equity, and a healthy environment. ORA helps develop their members’ capacity to take collective action on issues that affect their lives. Their member groups in rural, eastern Oregon communities promote the responsible and sustainable use of natural resources and agricultural land; social justice and equality; and thriving and diverse rural economies. PODER’s mission is to organize Latino immigrant families and youth in the Mission, Excelsior and other southeast San Francisco neighborhoods to put into practice people powered solutions that are locally based, community led and environmentally just. Verde brings environmental investments to low-income neighborhoods, designs community engagement strategies around these new investments, and ensures that investments link economic development and community well-being to environmental stewardship and health. Beyond Toxics is building a statewide environmental justice movement, working to advance the power of Oregon’s most vulnerable groups on the frontlines of disparities in health, wealth and work. The communities they serve are exposed to a disproportionate share of environmental health burdens where they live and labor. CWC believes that clean water is a human right, not a privilege; safe, clean and affordable water can and must be a reality for all communities. CWC works directly with rural, low-income, primarily immigrant communities to create community-driven water solutions through organizing, education and advocacy in California’s San Joaquin Valley. Lomakatsi Restoration Project develops and implements forest and watershed restoration programs, initiatives and associated projects in Oregon and northern California. Lomakatsi's mission is to restore ecosystems and the sustainability of communities, cultures and economies. The mission of the Mid Klamath Watershed Council is to collaboratively plan and implement watershed restoration, coordinate education on land management issues, and promote community vitality.